How about a fun dinner to celebrate Earth Day? I love making this little forest for my kids! Mollie says she came up with this ingenious presentation of broccoli trees planted in herbed rice pilaf for two artist friends of hers that were coming to dinner. If you prepare the rice ahead, this recipe only takes ten minutes to prepare. I was a bit hesitant at first at the choice of herbs (mint and dill--I almost just scratched it and went with something more "traditional" like basil or something. Boy am I sooo glad I followed the recipe--I love the mint and dill). Cook the 2 cups of rice according to package instructions. Fluff the cooked rice with a fork and set aside. 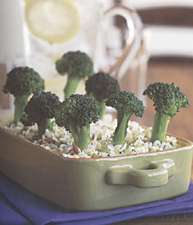 Trim the tough bottoms from the broccoli stalks and cut the tops into smallish spears of whatever size suits you. These will be your trees. Lightly grease a 9 x 13 baking pan. Melt the butter or heat the oil in a large, deep skillet or Dutch oven. Add the onion and salt and saute over medium heat for about 5 minutes or until the onion begins to soften. Add the garlic and the lemon juice and saute for about 2 minutes longer. Stir in the rice, some black pepper and cayenne to taste along with the optional ingredients. Taste to correct salt, if necessary, and spread in the prepared pan. Stir in the cheese and herbs. Now the fun part. Arrange the broccoli upright in the rice, and, if desired, drizzle with melted butter. Cover loosely with foil and bake just until heated through (15 -20 minutes). Serve right away. Have a happy Earth Day dinner!